Shelley Bean: Scrapalicious Design Team!! Happy Wednesday everyone! 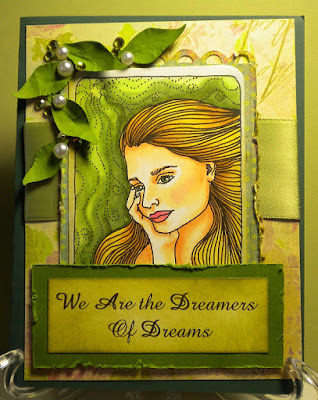 Welcome to the Scrapalicious Introductions blog hop. Today I have some fabulous news, I was selected to be on the AMAZING team over at Scrapalicious USA! I am in very talented company with this fantastic group of ladies. We will be having a weekly challenge on the store blog Scrapalicous USA every Wednesday starting May 4th, 2011. Please join us on this adventure as we all make new friends and see wonderful inspiration. I recommend you pop over there and join the followers list so you can be notified first when these challenges begin. There will be awesome prizes! In fact...pop over and see the details because Cindy is giving something away this Saturday! Here is a card I created using one of the stamps now for sale at Scrapalicious! Now here is a little information about me. My name is Shelley and I have been creating, drawing, painting or otherwise engaged in artistic adventures as far back as my 1st memory with a crayon. The pristine white front and back pages of my mothers books were never safe as I would resort to them when I ran out of other options to do my drawings and doodles. Luckily for me, she encouraged me by supplying me with paint boxes, art books and pencils and my father later enrolled me in oil painting classes to further develop my mind and love of color and putting down the pictures in my mind. In growing up years my main ambition was to use these talents somehow to bring enjoyment not only to me but hopefully to others too. Over the years I have created, designed and taught decorative painting woodcrafts for boutiques as well as designed rubberstamps for many companies. My latest venture has been in the launch of my own modest line of stamps at Shelley Bean Stamps such as the one used in my example above. Here at this blog I like to share all the many different creations I come up with or learn from others. I hope you come back and visit often and if you are not already a follower, I would be flattered should you decide to be one now. I enjoy making new friends and visiting other design blogs where we all share the common love of crafting. Here is the lineup of ladies in case you get lost along the way. http://scrapalicioususa.blogspot.com/ go here to join our challenges! http://www.scrapalicioususa.com/ go here for great deals! Please visit all of the ladies and show them some love! Thank you all so much for hopping along. Now, to find all the amazing deals and prices on your scrapbook and card making creations hop on over to the Scrapalicious Store! That is a very elegant stamp!! Love it!!! Oh my gosh super pretty! I love all the work put into this and the sentament and colors are just so perfect, love it! Congratulations for the DT scrapalicious. This card is very nice. BEAUTIFUL card---I am so excited for ya'll---everyone is so talented. Wow! Such a beautiful card & the fact that you drew it & made it into a stamp is awesome! I wish you luck with your stamps! Looking forward to the challenges. Beautiful card. Congrats on making the design team. Congratulations on making the design team. I love the card. Wow such great talent...love it!! You just got yourself another follower too!! Beautiful. Following you, to see what happens in the upcoming weeks. Good luck ladies. I love your card and the sentiment. You are so very talented. I am already a follower.